A mysterious artist-run cabinet of curiosities and library. Bentham suggested that his corpse might then be able to preside over regular meetings of his utilitarian followers. For ten years prior to his death, Bentham purportedly carried in his pocket a pair of glass eyes that were to be embedded into his embalmed head. Here, however, Bentham’s plan went awry. His face was grossly disfigured in the process of preserving it, and a substitute wax replacement had to be created. The real embalmed head was placed on the floor between Bentham’s legs, where it resided until 1975, when it was kidnapped by a group of students demanding £100 for charity. The university paid £10, and the head of the great moral philosopher was returned. 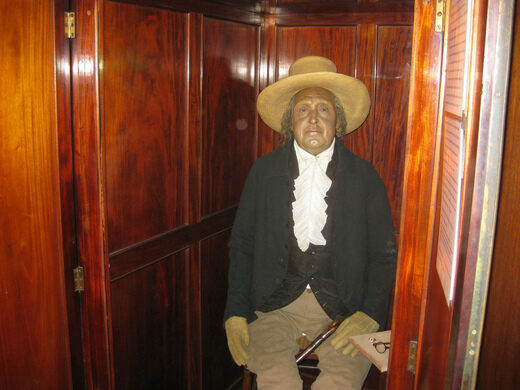 Since 2002, Bentham’s real head has resided in a climate-controlled storeroom at the UCL Institute of Archeology. Those with appropriate reasons to pay a visit may still do so by appointment, by first emailing nicholas.booth@ucl.ac.uk. Update March 2018: Bentham’s Auto-Icon is currently on exhibition in New York at the Met. It will be returned to UCL in July 2018. The Auto-Icon is located in UCL's South Cloisters. Originally built for London’s cab drivers, this bright green hut now serves anyone a hot drink or meal. Two Ming Dynasty lion statues guard the entrance to the journalism school. Four metal statues of massive animal penises stand outside the university's Animal Sciences building.